The balance wheel is the regulatory organ of a mechanical watch. Despite varying levels of impulse power, gravity, and temperature, the balance wheel is expected to deliver a consistent frequency with a tolerance of as little as 0.001 percent (in the case of C.O.S.C.-certified chronometers). With each oscillation of the wheel, the gear train (usually) progresses by two increments of the escape wheel, which fires the same amount of impulses along the pallet lever, powering the next oscillation of the balance. Even the most expertly fashioned balance wheel has minute imperfections that reduce the isochronicity (regularity) of its oscillations, and therefore it’s accuracy and precision. It just takes the very slightest unbalanced weight on one part of the wheel, a minute defect in the shape, or an imperceptible irregularity in poise. The watchmaker must do his or her best to combat these influences, adjusting and regulating the wheel so that the cumulative effect of these imperfections is marginal. With so much at stake, why complicate things by altering a pure and simple geometric shape? In horology, many challenges are overcome by taking three steps backward in order to advance by four. This is the realm of over engineering and complication, a place where every component has the potential to be reborn and reshaped. Although almost every balance wheel seems to become the same blurred circle when it rockets back and forth several times per second, there are some that, upon resting, draw gasps of awe from watch enthusiasts. Here are five of the most extraordinary balance wheels. Many, quite rightly, associate De Bethune with otherworldly watches thanks to the brand’s use of obvious deep blue titanium, three-dimensional moons, and bridges and lugs right out of a science-fiction novel. However, the brand’s radical and innovative balance wheels and escapements may be overlooked by more than a few. There are not many brands out there capable of creating their own balance wheels, much less reinventing them. But De Bethune has. The De Bethune Annular Balance is an exercise in aerodynamics and low-density mass management. The wheel is made up of a silicon disk and a rounded rim of a gold-palladium alloy. As a consequence, this wheel is one of the lightest in production. The mass of the rim provides ample oscillating inertia, while the low density of the alloy keeps the weight down. It’s also blue and space-aged: the perfect wheel for De Bethune! For those wishing to delve deeper into De Bethune’s evolution of innovative balance wheels, we recommend you check out the History page on the Résonique website. Who said a wheel needs to be round? Well, perhaps it does, but a balance doesn’t necessarily have to be a wheel. The only rule of a balance is . . . balance! If you look at any free-sprung balance wheel you will notice that every poising screw, inertia weight, or indentation on the rim is precisely mirrored on the other side of the wheel. These weights and screws are essential to the adjustment process, namely the moment of inertia, which serves to increase or decrease the speed and amplitude at which the balance oscillates. Picture a ballerina drawing her arms and foot in as she pirouettes, causing her rotational speed to increase or decrease dramatically. The mirroring on either side of the wheel is particularly important for poise. As a result, there is an extremely important step in adjusting the inertia of a balance: every turn of a screw must be replicated on the mirrored screw across the wheel. If this doesn’t happen the poise of the balance will be off. Most modern balance wheels are poised by a laser before being placed into an assembled movement, so the adjustments that take place at assembly by the watchmaker are designed to retain that factory-perfect poise. Considering the rule of a balance, it isn’t too hard to appreciate that a balance doesn’t need to be a wheel at all. Today there are a handful of brands using non-circular balances, but one of the most visually captivating is the Jaeger-LeCoultre Gyrolab (or as I call it, the “Tie Fighter”). Incorporating the “JL” motif into the Gyrolab with two inertia weights, and mirroring the configuration on the other side, the balance has enough mass on the periphery to provide the necessary inertia to oscillate. 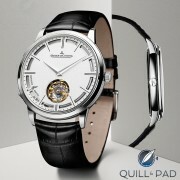 The result is an expertly crafted cocktail of marketing and watchmaking science. From the more-than-competent movement maker La Joux-Perret, and exceptionally well displayed on the Angelus U20 Ultra Skeleton Tourbillon, this variable inertia balance follows the same non-circular rules as the Gyrolab, but opts for a wider perimeter rim and forgoes the peripheral inertia screws to reduce air friction. The inertia weights are instead small gold disks pinned to the spokes of the balance; each weight has a small slot on its radius. Such are the sensitivities of a balance that the direction of the slot will alter the moment of inertia of the wheel. Take a look at the balance in the picture and note that the orientation of the slot is mirrored in comparison to the weight across the balance so as to retain poise. Produced from Patek Philippe’s Advanced Research lab in 2011, the GyromaxSi is one of three ingredients in the Oscillomax package, which also includes the Pulsomax escapement and Spiromax hairspring. The main body of the GyromaxSi continues the theme of non-circular balances but adds the ingredient of silicon. Comprising an ion-etched silicon brace with 24-karat gold inlays and adjustable inertia weights similar to the La Joux-Perret balance, the GyromaxSi is an exceptionally innovative and advanced balance for such a traditional and historic brand as Patek Philippe. The GyromaxSi. first featured in the limited edition Reference 5550P of 2011, is such a head turner that the sapphire crystal case back features a magnified section to showcase it. Ulysse Nardin embraced silicon technology as far back as 2001 and has been among the first to use it in the production of escape wheels, levers, and balance wheels. A fascinating development launched in 2015 was the Anchor Tourbillon, a silicon escape wheel and lever held in suspension by an intricate silicon brace. Among all of this luscious purple and blue the balance wheel itself is perhaps the most “normal” component! But in 2017 came the InnoVision 2, the successor to the feature-packed InnoVision 1, a watch that pulled together just about everything that Ulysse Nardin’s research-and-development department had on the table (and in the lab). Among nine other innovations, InnoVision 2 features a remarkable silicon and gold balance wheel. Silicon is arguably the ideal base material for a balance as it possesses such consistently apportioned mass and can be fabricated to unrivaled tolerances. The result is the perfect poise; what you then need is some weight on the periphery. This is provided by four intricate gold anchors and the initials “UN.” Not simply decorative weights, these gold anchors are adjustable as inertia weights. The bulk of the balance of the InnoVision 2 is a remarkable framework of ion-etched silicon. Whereas the balance from La Joux-Perret sought to eliminate air resistance, the InnoVision 2 has five silicon “paddles” etched between each spoke of the wheel designed to produce a constant air current that dampens amplitude peaks and troughs that occur in different positions. These are just a handful of the most exceptional balance “wheels” in horology. What others can you think of that deserve a mention? Let us know in the comments below. * This article was first published on December 11, 2017 at The Schmidt List: 5 Extraordinary Balance Wheels.